An almond-flavored ice cream chock full of nutty pieces of chopped, toasted almonds, there is nothing quite like a scoop of toasted almond ice cream topped with dripping homemade caramel sauce and sprinkled with extra chopped almonds! Just like Fenton's! Preheat oven to 350 degrees. Spread almonds in a single layer on a baking sheet and roast 10-15 minutes, until fragrant and toasted, but be careful not to burn them. Let cool, then chop into small pieces and set aside. In a medium sauce pan, mix the sugar, milk, half of the cream and pinch of salt and heat over medium heat just until the edges start to bubble and steam. Cook, stirring occasionally, until the mixture begins steaming and bubbling around the edges. Meanwhile, whisk the egg yolks in a separate bowl and set aside. When milk mixture is steaming and bubbling around the edges, remove 1 cup of it and slowly drizzle the hot milk mixture into the beaten yolks while whisking continuously, to temper the eggs. Make sure not to scramble the eggs by adding all the hot liquid too fast. Add remaining milk mixture and stir to combine into a thin custard. Pour the custard mixture back into the saucepan and continue cooking until it starts to coats the back of a wooden spoon (between 170 and 175 on a candy thermometer) - typically only 1-2 minutes. Pour the remaining 1 cup of heavy cream into a medium bowl, then add the warm custard by first pouring through a clean mesh strainer into remaining heavy cream and stirring to combine. Add vanilla and almond extract, then cover and cool completely in the refrigerator (4-6 hours or overnight) before churning. Once the custard base is thoroughly chilled, pour into an ice cream maker and churn according to the manufacturer’s instructions. When the ice cream is about halfway churned, add in the chopped roasted almonds and allow the ice cream to continue to churn until it is done. My ice cream maker only takes about 20 minutes to reach a soft serve stage. 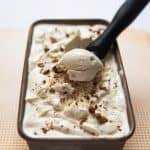 Pour churned soft-serve ice cream into a freezer-safe container, cover and place in a freezer to cure for at least 4-6 hours so the ice cream can harden all the way through.